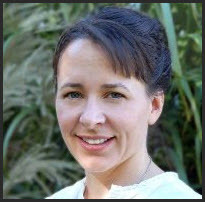 Kerri is the SharePoint Coordinator at Mercy Medical Centre in Iowa. She came across SharePoint for the first time in 2006 while checking out medical transcriptions. She embraced that job and started learning more and more about SharePoint. Two years later she was promoted to SharePoint Coordinator managing 9 departments in her division. Then she discovered Endusersharepoint, (now Nothingbutsharepoint), and started commenting on a bunch of posts. She soon attracted the attention of Mark Miller who pursued her relentlessly till she wrote him a post. Kerri is now a permanent fixture on Nothingbutsharepoint, one of the top contributors, and was even a moderator on Stump the Panel. Despite considerable challenges in her workplace she managed to tranform their world. 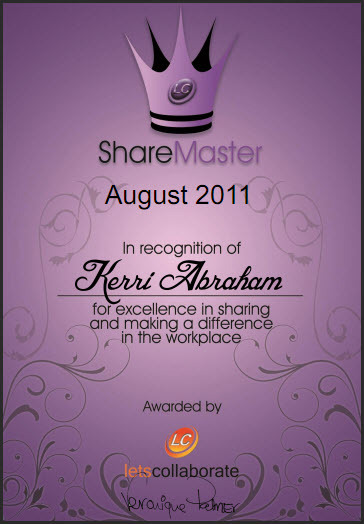 The article that put Kerri firmly in the ShareMaster of the Month Award was this one on Leading Change. It’s a thing of beauty and explains a major success of one of her departments who have flourished under her guidance. Well done Kerri! You have amazing insight on how to convince people to adopt SharePoint, how to use the technology to the best of its ability without any code, and to gain real business benefit from your solutions. More importantly, your ability to share your knowledge in easy to understand terms has made a huge difference to the many people that read your posts. You are one of those rare SharePoint business skills who just gets it. Thank you for sharing your special insights and help people win the adoption battle. That’s why you are a ShareMaster! Do you have a story you’d like to share? Find out more about ShareMaster. Previous What Will YOUR Greatest Business Achievement Be? I am new to sharePoint. I’m using version 2013. All i want to do is remove the default down arrow from the top nav bar on the master page. I only found to suggestions on the web. Both were incorrect. One was to add two properties and set one to true and one to false. The other was to add a class to the css and set it to display:none. Neither of these worked. Any idea how I the down arrow can be removed? I enjoy reading these success stories and the various approaches taken. Keep them coming! Kerri, you are most welcome. Your efforts are most certainly appreciated! You do a great job! Veronique, I’m so very honored to get your award, it is so very sweet of you! My goal in boldly stepping into the community and sharing my ideas and techniques has always been to give back to the group what you all have given me so abundantly. To be recognized in any manner for those contributions is very touching since it confirms that my efforts are appreciated and that I’ve made headway toward my goal, Never can I reciprocate the same level that you all have given, but knowing I’ve made even a small difference makes it all worthwhile! Thanks so much V, I’m really flattered and humbled. Excellent. She’s true Woman in Technology! Congrats!